For People On The Go! Sustained Release B & C, for Increase Energy. 30 Day Supply! Each "Super Vita Pack" contains 30 individually wrapped daily supply packs of all the daily vitamins and minerals you need with out having to open all those bottles. 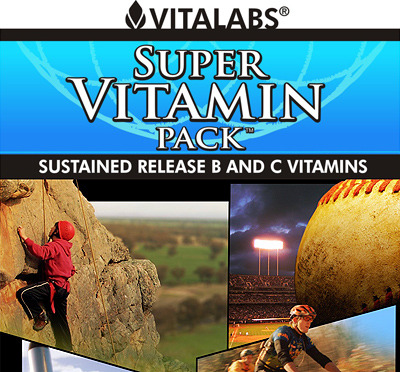 The SUPER VITAMIN PACK, by Vita Labs Inc has taken into account the unique nutritional needs of individuals living in a modern society. SUPER VITAMINS PACK, multi-vitamins and minerals contain extensively researched ingredients providing optimal amounts of vitamins and minerals, in absorb able forms as well as ingredients to enhance the body?s natural detoxification abilities. A high quality multi-vitamin and mineral formula with certain detoxifying ingredients provides the foundation of a smart supplementation program.